Meet artist Holly Simple, the Brooklyn based artist, cartoonist, illustrator, and " gif guru" who designed and illustrated the newest tarot deck added to our majestic tarot store today! 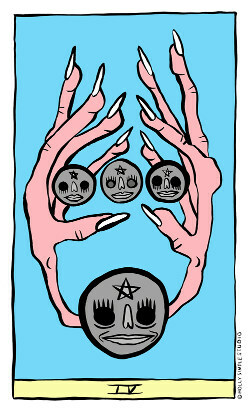 The Hoodwitch's owner, Bri Luna had a moment to chat with Holly about her process in creating this playful/ dark/cheeky deck of cards showcasing sad and happy smiley faces embellished on chalices, severed manicured fingers, and of course what would a self-proclaimed "Emo Sketchblogger" be without including lots of crying eyeballs! The Hoodwitch: Hi Holly, how did you get started on your tarot journey, and how long have you been reading? Holly Simple: Bri THANK YOU so much for the opportunity to chat! I was inspired to create my own deck after my very first reading about 2 years ago. The reading I received was so moving and touched my soul! Being a cartoonist I connected on a visual level to the deck used and was immediately launched into the creation of holly simple tarot. I started first with major research on the cards meanings and as i took notes i also sketched as visions came me. I started doing mini readings about 4 months into the process and very much still consider myself a novice reader, however i am deeply connected to the tarot as a spiritual tool. THW: Your deck is very playful but also explores some darker imagery such as severed fingers (with amazing manicures) and also lots of crying eyeballs. I love it so much! What was your initial inspiration behind creating your tarot decks and the imagery you used for it? HT: THANK YOU!I love using dark creepy imagery coupled with happy poppy color! the combination represents the beauty on the other side of the ugly. I have experienced this physically mentality , and spiritually so call upon those feelings and memories when creating my work. i absolutely love drawing ugly boney hands with gorgeous stiletto red nails.... it reminds me of my grandmother. THW: Do you stick with the same symbolism of the more traditional decks such as Rider-Waite or have you created your own system/meanings for each of your cards? HT: my deck uses traditional symbolism and carries the same meaning HOWEVER i'd like to think my visuals offer a different level of understanding. THW: What are some of your daily tarot spreads/ rituals? HT: I use the tarot as a daily oracle during my morning spiritual practice. when i'm inspired or when the cards call to me i will pull a quick 'past present future' reading to gain understanding or to receive messages from the universe. THW: Do you have any fun new projects that you’re currently working on that we should know about? HT: OMG! I'm working on finalizing a 44 card oracle deck (called fuzzy prism oracle)! I am so stoked about this as it is truly a spiritual tool to help others gain awareness, acceptance and understanding of their souls purpose. stay tuned!